I'm Always Mentally on Vacation: Guess What? 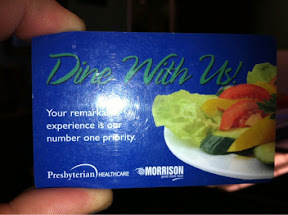 If your spouse has a cardiac arrest you get two of these meal cards good for $14 of eats at the hospital cafeteria. I know they meant well. Were these given to you? However well-intended, that is a very strange offering! John, Gigi had a cardiac arrest the first night. She is okay now. Ah, yes - it was the gap between then and this post that had me going. What is the timescale for her coming home? Not too long, I hope, can't have you getting too used to the bachelor lifestyle! Anywhere between one and two weeks before she comes home. I have tried to remain domesticated as possible.